I’ll start off by saying I liked this book. It combines a couple of my favourite genres into one-well-crafted punch: a strongly plausible alternate history where former President Teddy Roosevelt won election in 1912 on his independent Progressive platform, with a Great War spy thriller with some decidedly Bondian overtones. After a quick prologue in 1912 which establishes the setting with Roosevelt’s come-from-behind election victory, the novel flashes forward to 1916, and a world already in the throes of war, but with America still neutral but leaning heavily towards intervention. 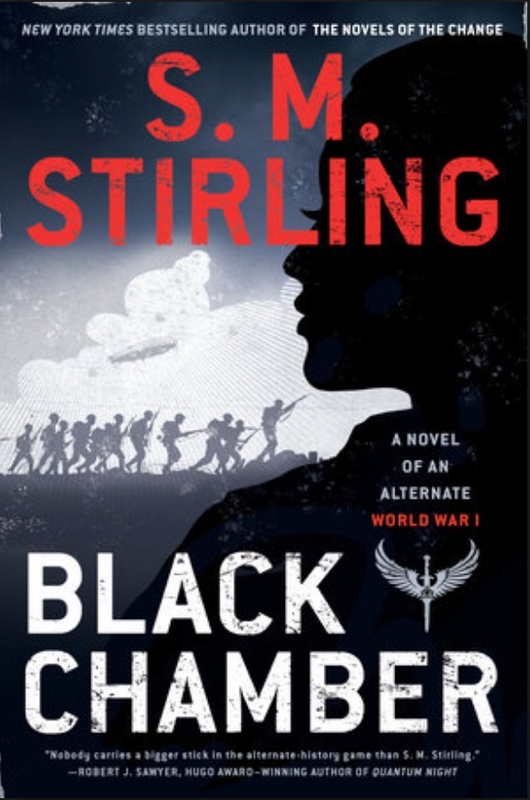 It’s against this setting that the Black Chamber, Roosevelt’s super-secret spy agency, dispatches its top agent, Luz O’Malley Arostegui, to track a German agent returning to Europe aboard a trans-Atlantic Zeppelin flight. In Europe, with but with a few changes the Great War grinds on into a bloody stalemate on the western front. In the East, the Russians have all but collapsed. Meanwhile, the Germans are desperate to break the western stalemate before the Americans inevitably enter on the side of the entente. That’s all I’ll say here without dropping some major spoilers. 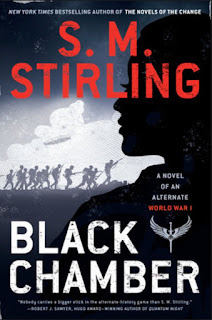 Black Chamber abounds with bronzepunk high-tech and secret weapons, which no thriller would be without. Stirling carefully delivers a believable and inviting alternate history where Teddy Roosevelt was able to quickly remake America in his own progressive image. Stirling gives us carefully crafted characters – both protagonists and antagonists- who are well rounded and equally sympathetic in their own points of view. This latter has been one of the author’s prime strengths all the back from his Draka series of novels. From what I understand, this is but the first of a series of novels relating the adventures of Luz O’Malley Arostegui and her fellow Black Chamber operatives, with the next one entitled Theatre of Spies. I for one, look forward to seeing more of her. I have a few things planned, including a review of Robert Conroy’s last novel, published posthumously, The Day After Gettysburg.